Fr. George gave me your basket! Not quite sure why he was so desperate to unload it, but you drove away just as I came looking for you. I can bring it next Sunday, or you can swing by sometime to pick it up. I'll get it next weekend. I always get it next weekend, or the weekend after that, or the weekend after that. That's our Father George. SF farce: Alien comes to earth in basket-shaped spaceship and threatens to destroy the earth unless basket, which represents their god, is released to them. Comedy: Basket turns out to be a valuable gift to the parish that the priest has mistaken for a different, similar, and not valuable basket. Romantic comedy: Person to whom the basket must go turns out to be the story's love interest, and deliverer feels that he must pretend to be Orthodox in order to persuade recipient to go out with him. Techno-thriller: the basket is equipped with state-of-the-art surveillance equipment to spy on parishioner 2. But while it is in parishioner 1's hands, it broadcasts her evil plot to slip mind-controlling drugs into the prosphora. Clancy: Meanwhile, in Moscow, a babushka gives an identical basket to Patriarch Alexei. Her KGB son finds her dead the next morning. At the same time, an Iranian baker receives a midnight visit. Koontz: Parishioner 1 hands it off to the wrong person. Now everyone wants her dead. 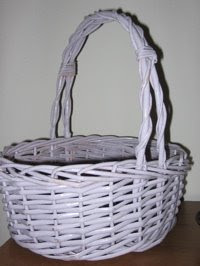 Evangelical: Parishioner 2 is angry with Parishioner 1 for accepting the basket. Can they both see their wrongdoing and find strength to give the basket to the local soup kitchen? Have we created a monster yet? The last thing I could justify, since I post here so seldom, is starting another blog, but I offer the excuse that it's a group blog, it's a finely focused niche topic, and it's fun. In that spirit, I offer you the Crones' Old Book Reviews. The idea is that there's a vast world of literature out there, and the length of our reading list doesn't change the fact that when anybody reads a book for the first time, it's new.